What does it take to preserve and restore The Falls of Clyde, the world’s last iron-hulled sailing tall ship now docked in Honolulu, Hawaii? 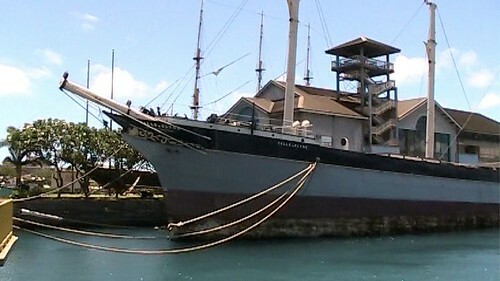 The “Falls of Clyde” currently berthed in Honolulu Harbor near the Aloha Tower is the only surviving iron-hulled four-masted full rigged ship and the last sail-driven oil tanker in the world. The ship has been closed to the public for several years as work continues to restore and stabilize her. We first learned about the ships plight from Jeanette Ainlay who has worked on the ship for over 20 years. Watch our interview with Jeanette at Scottish Fest in Waikiki. First launched in 1878, the Falls of Clyde sailed from England to India along international trade routes. According to the Friends of Falls of Clyde, the ship is 266 feet long with 1,746 net tonnage, and is one of a series of ships named for waterfalls in Scotland. Around the turn of the century, Captain William Matson of Matson Navigation purchased the ship. Her route then began in San Francisco with a belly full of fuel and supplies destined for Hilo, Hawaii. She returned with the steel tanks full of molasses from the sugar plantations. With her four masts and sails unfurled, the ship could cross the ocean in about 10 days, depending on weather. Over the years, she was converted to an oil tanker and hauled fuel to Hawaii returning to San Francisco with molasses. She was sold to Associated Petroleum in 1906 maintaining the same route and cargo. She headed to Alaska in 1921 as a fuel bunker where her rigging was removed. Honolulu residents brought her back to the islands the 1960’s, beginning preservation efforts. During the late 1980’s, the ship went into dry dock for extensive repair. While docked at the Aloha Tower, the ship served as an educational center as part of the Bishop Museum. Locals reminisce about attending fundraiser parties on her decks in those days. The ship was in danger of deteriorating beyond salvage. In 2008 the Museum intended to scuttle the ship when the Friends of Falls of Clyde organized. The group raised funds to purchase the ship and long-term plans were developed including fund raising strategies. In August, the group was awarded a federal National Trust for Historic Preservation grant for pre-dry dock work. They are counting on a “Save America’s Treasures” grant to help fund dry dock and repairs. A matching funds campaign has also been organized. Plans are to raise money to move the Falls of Clyde into dry dock where the hull will be sandblasted and the ship will be reinforced to increase safety to those who work on her. She will return to her pier at Aloha Tower where the deck will be replaced, the ship repainted and rigging reinstalled. The carved wooden bowsprit or maidenhead will be replaced. The first step in the process is to stabilize the ship to maintain its structural integrity. Once the ship is stable, she can be moved to dry dock for further maintenance and preservation. Only then will restoration efforts begin. The Falls of Clyde is listed as a National Landmark and the goal is to restore the ship to its days as an iron-hulled oil tanker. Bruce McEwan, President of The Friends of Falls of Clyde took us on a tour of the ship where we saw her current state for ourselves. The hull of the ship is rusty and is in need of sandblasting and painting. Once we boarded, we could not miss the crumbling and badly deteriorated teak deck in desperate need of replacement. The four masts, rigging removed long ago from, once reached 70 feet towards the sky, now lay on the deck. The rusted sections are marked to prevent injury from stepping on a weak area. “Most of us who have lived here, we have seen it when it was first restored in all its elegance so we sort of have a mental picture of what we want to take it back to“ said Bruce EcEwan. Below deck where there is less exposure to the elements, the ship is in better shape. The first room we entered was a sparse crew sleeping area. Four short wooden bunk beds attached to the sides of the walls made for tight quarters. Cubbyholes built into the sides and front of the room stored minimal personal belongings. Nearby was the head, a wooden box with a hole to sit on and a porthole for natural light. As on most ships, the cramped kitchen area required good organization skills to manage meal planning, cooking and serving. The massive iron stove was the focal point in the galley. On cold nights, this stove would make a cozy warming station for weary sailors. Entering the Captain quarters in the stern of the ship was like walking back in time. The wood paneling and teak benches formed a rounded room which showed an air of sophistication and elegance I had not seen on other parts of the ship. The white painted walls curved around the built in teak benches covered with burgundy velvet covered cushions. The Captain and his officers might have spent evenings in this spacious entertaining area discussing politics or business deals over a glass of port. As we toured the ship, I thought of the 12-16 man crew sailing across the sea. In port, on a sunny Honolulu afternoon the ship was quiet. Sailing 10-14 day across the Pacific, the ship’s crew would experience wind, rain, waves, blistering heat and bitter cold. The extreme conditions, cramped living areas and long days away from family was exchanged for good wages. For now, the teak deck is eroding and the ship is a reminder of days long ago. Her future depends on those who believe she is a valuable part of history worth saving for posterity. Do you want to learn more about what is happening with the Falls of Clyde today? Follow Falls of Clyde on Facebook or the Captain’s Log to learn about recent updates and events. The Friends of Falls of Clyde is a 501C non-profit organization accepting donations to save this unique part of history. Building on the Million Penny campaign begun by Honolulu Advertiser news reporter Bob Krauss in 1960, is the current Million Quarter drive. All funds collected are converted to 25¢ increments for tracking purposes and you can visit their website to follow the progress of the campaign. Click on the image below to watch the video of our tour of the Falls of Clyde with Bruce McEwan, President of The Friends of Falls of Clyde. For more information, visit the Friends of Falls of Clyde on the web.